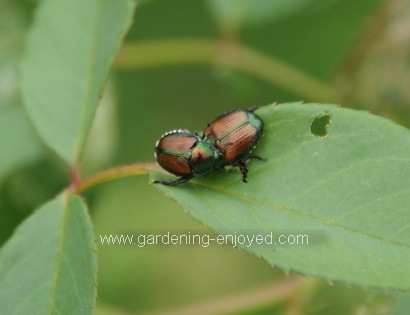 Dallying In The Dirt, Issue #322 - The beetles have arrived and they don't play music. 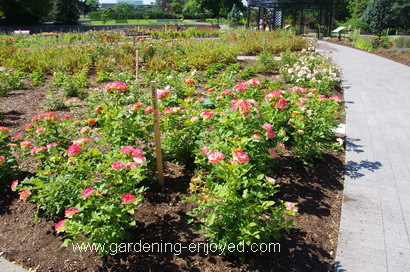 We spent a wonderful day this week, leaving the weeds behind at home and traveling to the Royal Botanical Garden in Burlington to have a look at their new Rose garden. We were a week past peak bloom but it was still wonderful to see. The story is even more wonderful. It’s amazing how beautiful a garden you can create with a lot of thought and planning, hours and weeks of hard work, a few Ooops, and 3 million dollars. What was truly amazing was the growth and the bloom on the Roses as they had only been planted about 8 weeks ago. Here’s their secret. They were very worried about Rose replant disease a storied problem with little in the way of scientific research but they made the decision that it was indeed a real problem and undertook the largest item in the budget. The soil from the old Rose garden was removed to a depth of 45 cm (18") and replaced with new soil. That soil was sourced from a new subdivision that was about to be built. Incidentally, that’s why it’s tough to garden in a new house, they sell off all the topsoil as their first revenue stream. The soil was modified with a commercial compost and then covered with a drip irrigation system. The Roses were planted and 7 - 8 cm (3") of mulch were applied. The planting was greatly delayed because of a late spring ice storm but the response was amazing and 8 weeks later the bushes had all grown well and flowered magnificently. All of the Roses were chosen for their disease resistance and hardiness in an attempt to make this a very sustainable garden. It really is worth the time to go and visit it and while you are there go around the corner and see how well the rebuilt rock garden is doing. The winter was not severe enough. Now, many dead plants would not agree with me. The dreaded Cucumber Beetle seemed to overwinter very nicely and has returned to my garden with a vengeance. Cucumbers, Zucchini, Melons, Squash they all share this beast. Not equally, it definitely has preferences and Cucumbers are not one of them although it can do terrible damage to them. My main method of attack is to go for a walk early in the morning. 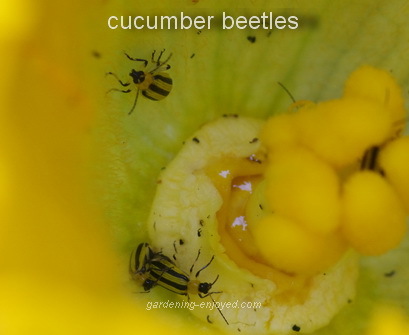 They like to spend the night deep inside the large flowers of Zucchini and I find them there and pump my insecticidal soap into that nice yellow trap. That seems to keep their numbers down to a manageable size allowing all of those crops to grow and produce. They also have a larval stage in the soil that loves to eat the roots of Cucumbers and that has been a problem in past years. My Cucumber vines would grow to a certain size and then just start to wilt as their roots were attacked. This year my Cucumbers are growing in one of my subirrigation containers and as they are covered with a plastic much cover the soil is unavailable to these beasts and the vines, so far, are doing very well. The Zucchini are producing at a great rate and we have even had sufficient to sell a batch through Seed Voyage a great new concept you should check out. Cucmber beetles are relatively small and hard to catch but to make up for that this week I found a much larger invader. Japanese Beetles are attacking my Eggplant. I was deluding myself into thinking they would not be back this year. I have never seen them on the Eggpplant before so I went out and checked their favourite Rose and there they were. I chase them with my needle nosed pliers. They nice and large and easy to grab and they give such a satisfying crunch when you close those pliers on them. They are rather beautifully coloured but their ability to consume my plants quickly takes away any admiration I might have for them. There are traps that will catch them but those traps also attract the beetles from your neighbour’s yard. If you want to use traps offer to buy them and give them to your neighbours so your beetles will leave your yard and go to theirs. Bob Asks? The last number of years the tomato plants I have been planting grow exceedingly tall, especially the cherry tomatoes and some extra large tomatoes. The plants do produce a high volume of tomatoes especially the red cherry tomatoes. Some plants will grow upwards of 9 to 10 ft. tall or more and I don't have stakes that long. I have not started fertilizing the plants this year but the fertilizer I use is 18-18-21 Someone suggested cutting off the top of the plant. If |I do this will it stop the upward growth and will it cause the plant to start growing side shoots. When is the best time to cut off the top and how much should I cut off? Ken Answers! I have Tomatoes as a weed in parts of my garden because the fruit that is on the 9 ft plants, I can't reach and it eventually falls to the ground where the seeds overwinter. You can cut off the top and that will indeed produce many more side shoots which will eventually produce fruit as well. Just do the cut when the plant reaches a height you are comfortable with. and get ready to have a very wide plant as the side shoots spread out. Donna Asks? My husband has a Bartlett pear tree 9 yrs. old. The rabbits ate the bark 4 yrs. ago, there is a new limb now that has grown up from the graft. It had 3 clusters of blooms each one had 4-5 blooms but only one started to develop that looks like one wee pear about the size of his thumb nail. Could it be that we didn’t have enough bees to pollinate. Is this still a true pear tree after the rabbits ate it? If so can we do the bees job with a Qtip?